Losing everything is hard, but losing everything when you’re 96 and hearing-impaired is even harder. Ruth Cook’s Los Angeles–area home was incinerated by the Woolsey Fire in November. 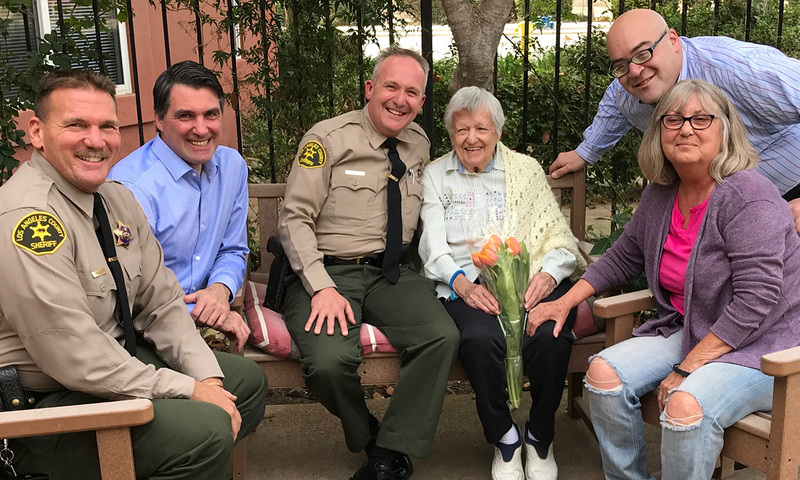 But there was something that made dealing with the loss a little easier: the continuing kindness of the two L.A. Sheriff’s Department deputies who rescued her and her pet from the fire’s path. Since Cook’s hearing isn’t what it used to be, the deputies helping to evacuate residents had to force her door open to get her attention. Rogers said when he finally got Cook out of the house, her 12-year-old dog, Maggie, got spooked and bolted. So he went after the dog while another deputy, Tom Henzgen, helped Cook into the front seat of the car of a neighbor who was evacuating. Rogers was able to catch Maggie and get her into the car as well. “We told the driver to go, and he drove them out to safety,” Rogers said. Just hours later, the fire tore through the neighborhood, destroying pretty much everything. Two days after that, Rogers’ wife was watching the local news and saw an interview with the neighbors who lived next to Cook, standing amid the charred ruins of their home. They said they were worried because they hadn’t been able to locate her. Rogers went the extra mile and called the news station to try and contact Cook because he wanted to make sure she got out OK. He discovered that she had spent seven days at an evacuation center before a volunteer helped place her in an assisted living facility. In December, Rogers and Henzgen paid her a surprise visit. Henzgen said it felt good to see Cook again, because many times they don’t get the chance to find out what happens to the people they save. Cook is doing remarkably well, considering that she endured a four-hour ordeal fleeing the flames and ended up losing her home and all belongings except her dog. The assisted living facility is collecting donations of bedding, clothing, pet supplies and a wheelchair and walker to help her rebound from the tragedy. No doubt being reunited with two heroes who care for her has helped, too.